THE VILLAGES – For five chukkers and most of another, the players of Team USA and Team Mexico raced back and forth in the Camacho Cup at The Villages Polo Club on Friday afternoon. But with just 34 seconds remaining, the match was over. Memo Gracida galloped out of the right corner to control a loose ball, turned his horse 360 degrees toward the goal and snapped a wrist shot through the post to give Mexico a 16-15 victory. A crowd of more than 4,000 people, the largest to ever watch a match at The Villages Polo Club, roared its admiration for a well-played contest. Mexico had rallied from a 7-2 deficit at the start of the third chukker to win the Camacho Cup for the third straight time. 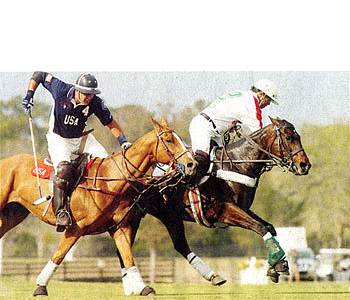 The international competition had not been played since 1988 in Palm Beach, Florida. And two of those players – brothers Memo and Carlos Gracida – were again together on the field. This time, Carlos Gracida scored 10 goals, many of them set up by his brother. Memo had just one goal, but it was the game-winner. “The experience of those two brothers was the difference,” said teammate Julio Gracida, Memo’s son. And the American players agreed. Mexico fielded a 27-goal team and had to give Team USA (24 goals) a two-goal handicap. Tommy Biddle extended the lead to 3-0 with a shot from 70 yards just 22 seconds after the opening throw-in. Carlucho Arellano made it 4-0 before Carlos Gracida scored from the 30-yard penalty line. Kampsen had a breakaway with the ensuing throw-in for a 5-1 lead, and Team USA appeared in control. “They came out with everything they had and we were caught sleeping,” said Julio Gracida. Carlos Gracida set up his nephew Julio for a goal early in the second chukker, but Team USA extended its lead to 7-2 on goals by John Gobin and Arellano. It was time for Mexico to climb out of its hole, and Carlos Gracida provided the ladder. He scored on an undefended penalty chance and then grabbed the ensuing throw-in and raced along the boards to score. Biddle answered from out of the crowd in front. But Pelon Escapite got a breakaway with the next throw-in to close to 8-5 with 30 seconds left in the chukker. The turning point for Mexico came early in the second half. Carlos Gracida scored with a penalty shot that Team USA protested, earning it a penalty for unsportsmanlike conduct from the midfield stripe. Escapite carried the ball all the way in to make it 8-7. And Carlos Gracida made another run along the boards to tie the game at 8-8 with five minutes left in the fourth chukker. “We started fouling, and they capitalized on it,” Kampsen said. Carlos Gracida had six of his game-high 10 goals from the penalty lines. Gobin and Biddle scored for Team USA and Carlos Gracida and Escapite answered to close out the fourth chukker at 10-10. Team USA got quick goals from Biddle and Arellano early in the fifth chukker for a 12-10 lead, but Mexico rallied and Carlos Gracida retied the game at 13-13 on a penalty shot with 40 seconds left in the chukker. Overtime loomed as the sixth chukker began. Biddle got the lead back with a penalty shot, but Memo Gracida set up Carlos to make it 14-14. Mexico took a 15-14 lead on another penalty stroke by Carlos Gracida. But Arellano scored with a breakaway with three minutes left. As the clock ticked down, Gobin stole the ball and carried it to the corner where he found himself undefended. “When John stole that ball, I thought we had it won,” Biddle said. Instead, Mexico gained control and carried it deep along the right boards. Memo Gracida chased a centering pass and turned it into the game-winner.